Founded in Florence in the early 1970s, eponymous label Roberto Cavalli has become an internationally celebrated fashion-house synonymous with flamboyancy and glamour. Delivering colourful maps, provocative designs and animal printing, the brand continues to showcase its iconic pieces. Presenting this red silk blend pleated gown with embroidery from Roberto Cavalli featuring a deep V neck, a sleeveless design and a crisscross back. The model is known for looking her best on the runway and off. 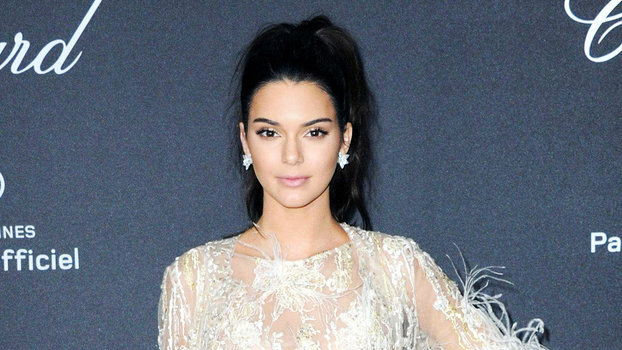 Whether it's a red carpet gown or a street style look, Kendall Jenner is always on the best-dressed list. Blue silk embellished trim pleated gown from Roberto Cavalli. Black silk pleated sheer blouse from Roberto Cavalli. Brown stretch silk blend bead embellished gown from Roberto Cavalli. Black silk full pleated skirt from Roberto Cavalli featuring an embroidered design, a high rise and a lightweight construction. Roberto Cavalli Blouse - Chiffon, belt, floral design, long sleeves, wide neckline, no pockets. 100% Silk. Roberto Cavalli Red Polyester Dress - Roberto Cavalli red polyester dress. Size 46 IT. Very good condition. Red leather and suede perforated loafers from Roberto Cavalli. Red and black silk printed palazzo pants from Roberto Cavalli. Roberto Cavalli Asymmetric Strap Pumps - Sangria red leather asymmetric strap pumps from Roberto Cavalli. Material:Leather. Brown handkerchief midi skirt from Roberto Cavalli featuring a waistband, a high waist, a flared skirt and a mid-length.